It is inherent for people to purchase alluring pieces of furniture that will smite any visitor. To complete the ensemble of glamour and interior décor, glass top computer desks will bring a perfect intermingling with other items completing the desired beauty. This type of desk shimmers with exotic and appealing magnificence. It is a trendsetting style of creating impression if you purchase the right one. Although they are perfect and appropriate decorative, before you acquire one, a cluster of considerations have to be weighed correctly. Consider the space available, the size of the entire work station and the necessity for adding extraneous components. This is because your glass desk is one way of utilizing space prudently while creating an illusion of its correct use. Glass top computer desks are not that huge compared to others like the classical roll top ones when it comes to space. The contemporary nature of the desk as it has a vibrant modern styling and brilliance can enable you to use your space without comprising the office or dwelling rooms. The desks are perfectly functional, there is no way you cannot get a space sufficient to place it in your business or home. 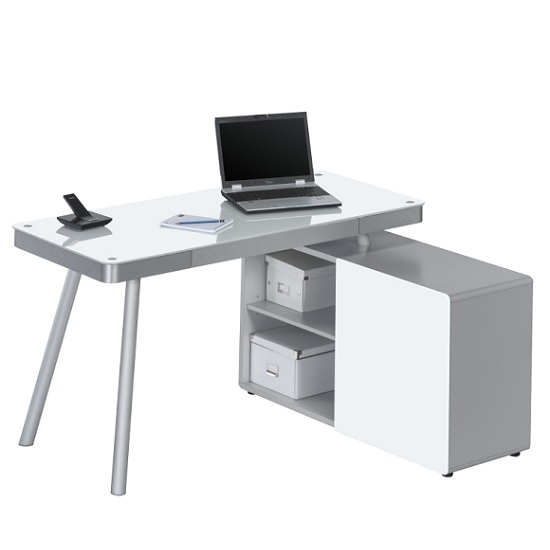 The desk will fit computer systems well enough and still create an impression on visitors. This is advantageous for a business that has small spaces, for instance the cubical stalls; you will be able to store your, monitor, printers, CPU and towers comfortably without disturbing the inviting appearance of crystalline glass. Remember, impression in offices and business premises is a huge determining factor on how you induce clients. Similarly, the glass top computer desk can be placed in your home office and create an illusion of space. You can complement the desk with other furniture such as a few chairs, a mahogany table and book shelves; this creates an inerasable impression of an alluring office. The modern nature of the desk is what makes it have the illusion of prominence. However, you must also proceed carefully so that you will have durable and strong glass because it is extremely delicate. You can get high quality glass by choosing that which has thick tempered glass that is frosted. The desk must also sufficiently enclose all the computer components without wasting space. It can also be reinforced with rounded edges with a strong metallic frames that are coated and scratch resistant. This way you will use the available space comfortably while retaining the impressive factor. To create an alluring illusion of a spacious office or room, you can conflate the crystalline appearance of glass with color splashes. Maintenance of the desk is another important factor that enhances beauty and style. You should keep it clean with a cotton material that will not scratch and damage the surface. The monitor, CPU, and other components of the system that may scratch the glass ought to be placed on top of protective cushions. The glass desk is made after accessing the space available and the size of the system, this enable you to have the appropriate one and still utilize space correctly and elicit the illusion of spacious rooms.